Australian Design Review (ADR) has today launched a teaser trailer for upcoming series The Toorak Project. Set to appear on the website in 2019 and 2020, The Toorak Project is a series of videos detailing the concept to completion of a remarkable SJB-designed ‘mega house’ in the Melbourne suburb of Toorak. Commisioned by an international client living in Hong Kong, the project is a unique one for SJB, explains architect Fei Chau. “They’ve actually just handed over the building to us and said, ‘we trust you’ and I’ve never had that before,” he says. The series will follow each stage of the journey from the design through to the specs, the build and the completed house. A SPRAWLING Hawthorn mansion described as “one of Melbourne’s finest”— with an 18-seat teppanyaki kitchen, two pools, a ballroom and a special bathroom treat for Tigers footy fans — could break the state’s house price record. Take a look. A SPRAWLING Hawthorn mansion could break Victoria’s house price record after being put up for sale off market with an eye-watering $45-$50 million price tag. Featuring nine bedrooms, seven kitchens, seven bathrooms and two pools, the four-storey ‘Avon Court’ at 18-20 Shakespeare Grove will challenge the $52.5 million benchmark set by Malvern’s Stonington Mansion earlier this year, according to the agent. An 18-seat teppanyaki kitchen, Victorian ballroom, 4000-plus bottle wine cellar, 10-car garage and two rooftop terraces with city views are other jaw-dropping inclusions at the lavish trophy home. The 4645sq m property shares a fence with ex-Australia Post boss Ahmed Fahour’s own Hawthorn mansion at 21 Coppin Grove, which was listed for $40-$44 million last week. Former Richmond Football Club president Clinton Casey sold the luxe Avon Court to Autobarn co-founder Garry Dumbrell for $20.25 million in 2009, who in turn sold it to the vendors, a local family, for $19.8 million in 2014, CoreLogic records show. An image of Tigers legend Jack Dyer is tiled into one of the bathrooms. “Most people will have never seen a home as spectacular as this. To say that the property is resort-style is a huge understatement. There are not too many resorts as high quality or as luxurious as this,” he said. “The home’s historic features step back in time and blend magnificently with ultra-modern finishes. It has everything that any owner could ever want — and much more. Cashed-up local and international buyers are expected to compete for the right to enjoy an 18-seat private cinema, library, billiards room and bar, gym, sauna, “flower room” and staff quarters close to the Yarra River. RT Edgar agent Helena Chow said the property was “one of Melbourne’s finest” and would challenge the Victorian record because of its sheer size. The property is for sale by expressions of interest with no fixed closing date. 7 luxury residences curated for the discerning Toorak buyer. Palais Toorak is architecturally distinguished and refined, transcending eras and blurring global boundaries; as equally at home in Mathoura Rd, Toorak as it would be on the Avenue Montaigne or Fifth Avenue. Inspired by New York's cutting edge Style Moderne and infused with enduring Parisian Art Deco undertones, the design strikes a perfect balance between historic grandeur and glamorous modern design. Palais Toorak is a distinct return to grand design and luxury living for modern Toorak. 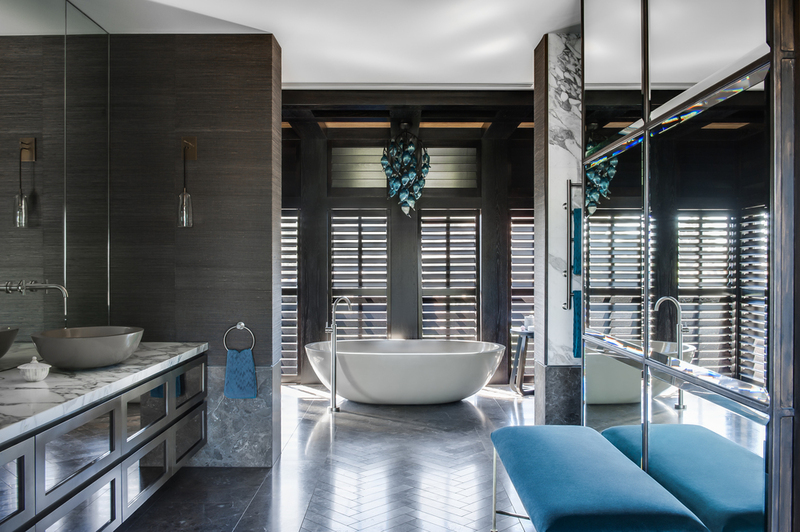 Lead by Craig Easton, Palais Toorak has brought together Melbourne's luminaries in residential design whose sole focus has been to bring back a sense of greatness to Melbourne's high-end living environments. Robert Mills Architecture, SJB Interior Design and Paul Bangay Garden Design are the names behind these seven highly considered residences that use a worldly design aesthetic to reimagine contemporary apartment life. At this coveted Mathoura Road, Toorak address, the graceful, low-rise design comprises three ground floor luxury apartments and two first floor luxury apartments, a sub penthouse and two level penthouse with private rooftop pool. Contact our sales team for an appointment at the Palais Marketing Suite on Toorak Road. This beauty is has been taking shape behind countless design meetings, workshops, planning and a tireless pursuit of perfection. With Craig Easton's fastidious attention to detail and a world class team of Rob Mills Architecture, Andrew Parr from SJB Interiors and Paul Bangay Landscapes. Palais Toorak heralds a distinct return to grand design for modern Toorak. WEDDING bells could be on the horizon for Banyule’s most historic home, which is tipped to become Melbourne’s next premier event venue. The owners of Banyule Homestead will put a proposal to the council to use the Buckingham Drive property for weddings and other formal events, with its website, The Voeux, advertising it as “coming soon” in January 2017. Last year the Heidelberg 9085sq m heritage listed property sold to a young Toorak family for $5.2 million with Heidelberg Leader reporting the owners did not plan to subdivide the land. Heidelberg Leader was alerted to the plans after some community concern that landscaping works on the property could lead to future development. Community tensions remain high ever since a proposal in 2013 by a former owner to remove 11 trees for a three-storey and two two-storey development was knocked back by both Banyule Council and VCAT as the land was subject to heritage and environmental constraints. But the Banyule Homestead’s venue manager Claudia Lee confirmed there were no plans to subdivide the property. Ms Lee said the owners would be applying within the next fortnight to the council to use the homestead for events. “We plan to have it as a wedding venue or special occasion venue,” Ms Lee said. She said the landscaping works on site had been cleared by Heritage Victoria and were about maintenance, clean-up and upgrades. Banyule mayor Craig Langdon said the council had been advised to expect an application to use the homestead as a function centre, and would consider any residents concerns. He said officers had inspected the site and while permission was not needed for most of the landscaping works, council would consider what action to take on three trees that needed planning permission to be removed. He said Heritage Victoria has also granted an exemption from requiring a permit to conduct the minor landscaping under the Heritage Act. The estate is the most historically significant property in Banyule dating back to 1840s. It is one of the few remaining pre-gold-rush mansions in Melbourne designed by architect John Gill and commissioned by English-born pioneer Joseph Hawdon in 1846. Strong sales for Manhattan Toorak - One apartment remaining! 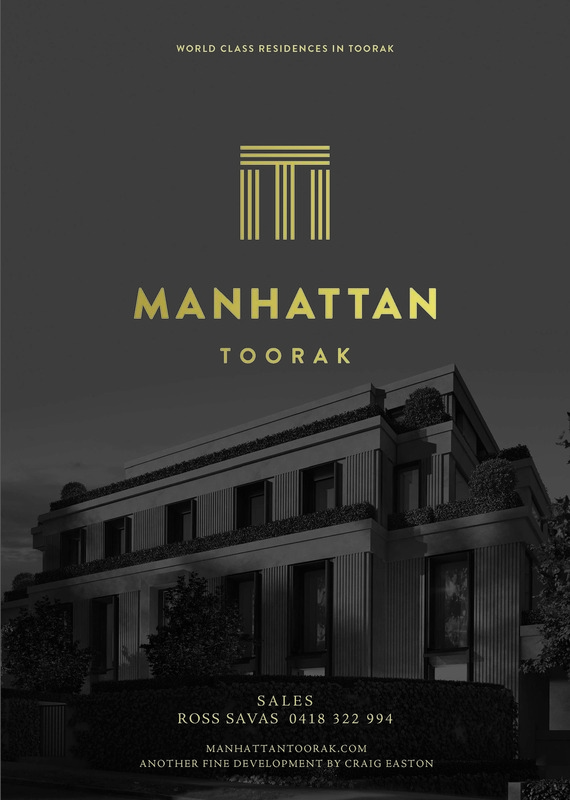 Manhattan apartments have rapidly become Toorak's new iconic address deriving inspiration from the greatest boutique buildings of the world. Set in one of Toorak's finest streets mere metres to the Village, the expert partnership of luxury developer Craig Easton, award-winning architect Rob Mills, and internationally famous landscape designer Paul Bangay have created a world-class lifestyle. Sheer excellence waits within this superior single-level, ground-floor apartment, one of a few remaining available. To rival the grandest of Toorak's mansions, executive residences employ superior architectural flair and a commitment to unsurpassed luxury, complemented by vast proportions. Apartment G04 features refined open plan living, dining and kitchen served by Miele and Leibherr appliances, while throughout are solid natural stone and marble. A double bedroom with fitted robes and en suite, and a study zone enhances the main bedroom with walk-through robes and a superb double en suite. A wrap around garden terrace with mature trees and European-style al fresco dining frame this elegant residence. A concierge, building manager, multi-zoned heating/cooling, two car spaces, storage, 7 star energy rating, electrical generator, and state-of-the-art amenities are just the beginning of this truly elite development. This visionary 5 bedroom / 5 bathroom Victorian mansion is an illustrious, fully-renovated residence of epic proportions gracing approx. 1,800sqm of Paul Bangay landscaped gardens. An inspired collaboration between Stephens & Co Architects and award winning Tania Di Lizio interior designers; spectacular use of colour, textures and spatial planning gives rise to a stunning neo-contemporary masterpiece that perfectly respects the integrity of its rich heritage origins. Features regally proportioned formal living / dining rooms, spectacular Miele finished kitchen with large scullery, adjoining living and dining areas anchored by panoramic glazing and pool-view alfresco entertaining pavilion, versatile home cinema / rumpus room, majestic upstairs library, sumptuous marble laced en suites, powder rooms, and state-of-the-art poolside gymnasium / bathroom. Includes the finest natural stones and timbers, hydronic heating, ducted heating / air conditioning, intercom, return verandahs, solar-gas in-ground pool, and triple garage (plus carport) with internal entry via secure auto-gated drive. Supremely positioned in leafy Study Park with easy access to Yarra walks, Kew Junction shops & restaurants, public transport, leading Private Schools, CBD and Freeway. Spectacular Family Sanctuary on Exclusive Yarra Riverfront - Yours for the buying! 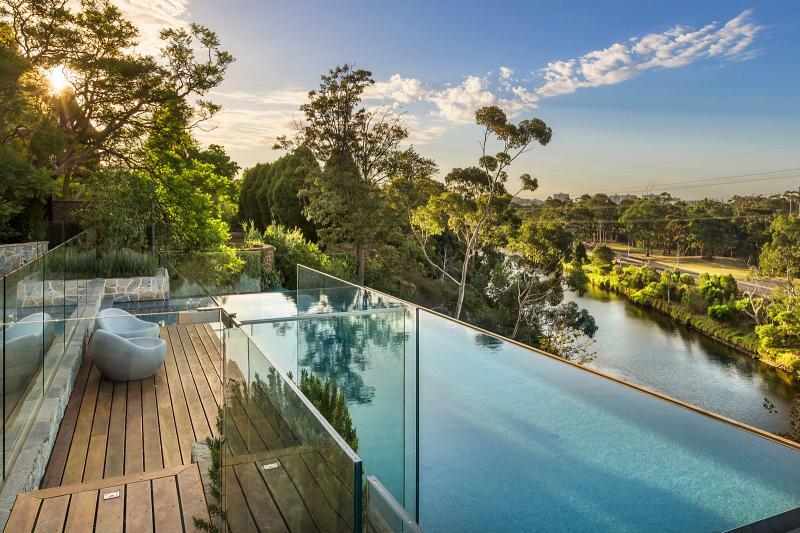 Prominent against a breathtaking backdrop of Yarra River and Royal Burnley Golf Course views, this award winning Toorak residence with lift, infinity pool, boathouse and private jetty sets a new benchmark for luxurious family living in one of Melbourne's most prestigious positions. Awarded the Master Builders Association Victoria's "Excellence in Housing - Best Renovation/ Addition" in 2015, extensive renovation and reconstruction works by leading SJB Architects has created a consummate contemporary environment on a significant riverfront parcel (1691sqm approx. ), distinguished by world class craftsmanship, state of the art technology and renowned Paul Bangay designed landscaping. With absolute privacy behind a high walled entry, four magnificent levels seemingly hover amid the privileged northern views with multiple living and entertaining zones arranged to open directly onto a sweeping alfresco terrace with dedicated outdoor domain (wet bar/ OFP) and incredible infinity pool poised above the Yarra's swirling waters. Sophisticated elemental tones and six star stone finishes frame an uncompromising floorplan that whilst luxurious, offers outstanding family practicality close to leading independent schools, parkland and the CBD. With full Gaggenau kitchen featuring rare Pilbara marble benchtops, two studys, gym, climate controlled wine cellar, monitored CCTV security, remote garaging for four. 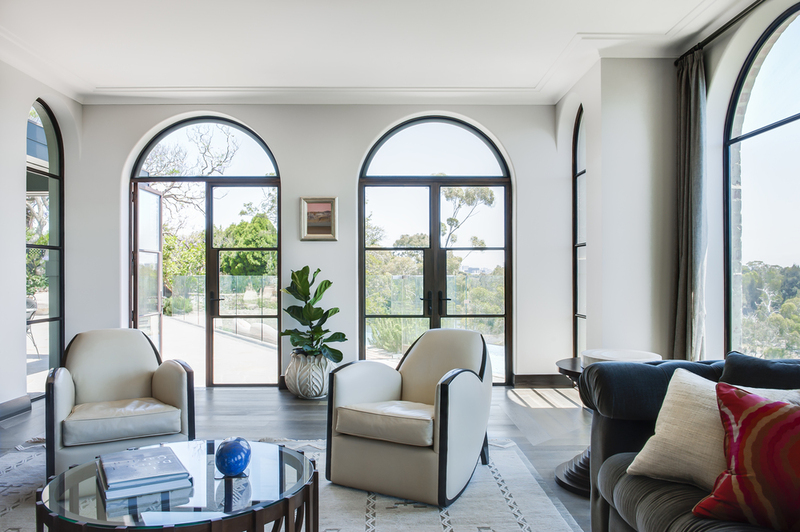 When a long-term client approached Craig Easton with a historic but dilapidated tudor-style home on a spectacular site in Toorak, it seemed destined for the wrecking ball. After careful consideration, Craig believed that the home had period elements worth saving, so set about planning a major renovation to repair and restore the exterior and start fresh inside. Having been appointed as Client Side Project Manager, Craig handpicked a team of professionals that best suited this style of complex and precise workmanship. Great thought was given to select the best design and consultant team including Town Planners, Engineers, Quantity Surveyors and Site Administrators. Andrew Parr led the interiors on behalf of SJB and Paul Bangay was appointed as Landscape Designer. SJB were appointed as both architect and interior designer, but the traditional budget split between interiors and architecture was flipped to create a generous 75% budget for interiors with 25% remaining for architecture. Had the home been demolished as was planned, this allowance for extensive interior work to an incredibly high level of detail would not have been possible. It’s exactly the kind of valuable experience that Craig is able to bring to a project, assisting clients in the decision making process and having a high-impact on final project outcomes. Assembling a site team, Craig included some of his most professional and long-standing employees with years of high-end residential construction experience. Branco Radin was responsible for the main residence renovation and restoration, with Craig Irving looking after the new extension including pool, den, garage, and gymnasium and piling works. Wes Scroczynski, an expert joiner, was given the task of finishing contractor working alongside SJB interiors to deliver the precise finishes our clients have come to expect. Other valued Easton team members include Greg Tivendale, Benny Emmerton, Jordan and Brodie Easton, Timothy Laidlaw and Harry Maxwell. It was a fantastic team effort and the results are truly spectacular. New Staircase with skylight and chandelier – chandelier is motorized to change light globes, dust, etc. Amazing Designs: Astonishing design hidden from view in Toorak. A section of the tennis court raises to reveal a ramp to the underground car park. In Melbourne's mansion suburb of Toorak, big-spend residential has been the template from the get-go in the 1840s. On a 2500-square-metre block sits a fine and symmetrical 1928 brick house, which has had such a provenance of deep-pocketed owners it has been through regular renovations by leading architectural firms. The latest, by Molecule, is perhaps the least apparent in its tasteful manifestation, which is seen right through the interiors. Without doubt, it would also be the most comprehensive. Not only did the architecture practice partners Anja de Spa, Jarrod Haberfield and Richard Fleming redo the house from the stripped-back shell of walls, ceilings and floors, they also put an incredibly appointed car park for the owner's car collection and a 12-seat theatre into a six-metre-deep hole in the backyard and then planted a lawn on top of it. The car park – with a tiled floor, LED-lit parking bays, mirrored wall and a ceiling of light – is accessed via a ramped tunnel that becomes apparent only when the base-line section of the tennis court is hydraulically lifted. This folks, is amazing design. "It takes a minute to lift the tennis court," Haberfield says, "and a minute to close it down." The car park, which de Spa agrees "has the quality of a commercial showroom, or even a disco", was an idea pushed by Fleming. It is modelled on the Batcave that appears in the Dark Knight episode of the Batman movie franchise. It is also why the architects code-named the benchmarking project, which they pushed through from drawing board to occupation stage in a mere year, "The Wayne Residence". "In a very well-mannered heritage house, this is the secret subversive element," Haberfield says. Ascending a staircase from the garage that moves up blackbutt treads into the lower-living floor, there is an experiential shift because, Haberfield says, "we were asked to reintroduce something of the glamour of a special, just pre-deco home". "Earlier architects had stripped back a little too much from the grand spaces and we needed to bring back their period strength and character." Aside from the casement windows and the room volumes, everything has been touched by the Molecule designers. "It's the first project where we did everything from the car park to the cushions". As de Spa explains, "everything from the wallpaper, the window treatments, the customised furniture and the joinery – including the walnut library shelving – has been very carefully considered and very carefully composed, because we were seeking timelessness in the scheme". So fine is that detailing that all 12 floor rugs were designed by de Spa to fit like a kid glove into a classy family home. Project image gallery is available here. This classic Toorak home recently underwent a significant internal renovation to update the interiors and make way for a hidden basement with a difference. Heralding a new era in sophisticated and cosmopolitan living in the heart of Toorak Village. The Manhattan compromises just 14 world class residences, crafted by leading luxury developer Craig Easton and designed by Rob Mills. On the doorstep of Toorak Village, one of the most prestigious suburbs in Australia, this magnificent building is the very essence of life on the highest level. Energy Rating - 7 Star energy rated - Double glazing throughout, door & window seals, sheer roller blinds, insulation in excess of requirements, sustainable building elements. 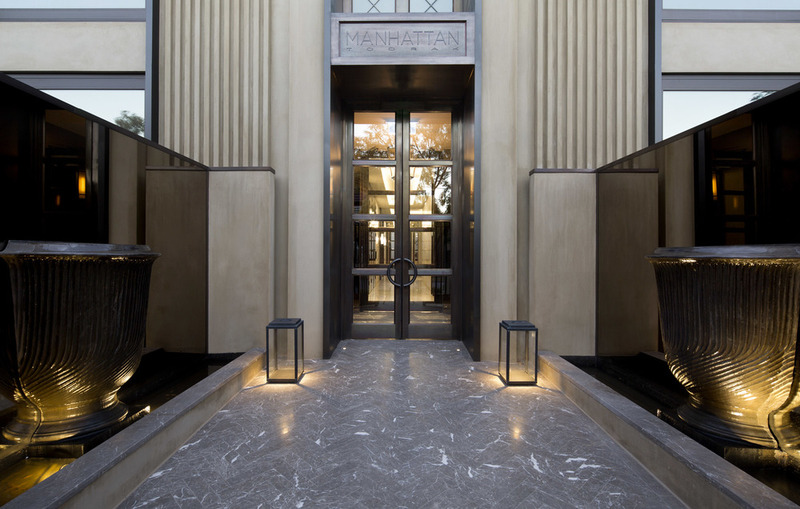 The April Kay & Burton Report was filmed on location at Manhattan Toorak. The Manhattan will have a concierge on site 20 hours a week to assist residents and also start their cars and bring in their mail if they are out of town. The wealthiest residents of Melbourne's most well-to-do suburb of Toorak often have more than one address. When it's time to leave their stately city homes to take up primary residence in their seaside retreats along the coast, many want to retain a city base in the old neighbourhood that they can lock up and leave securely. 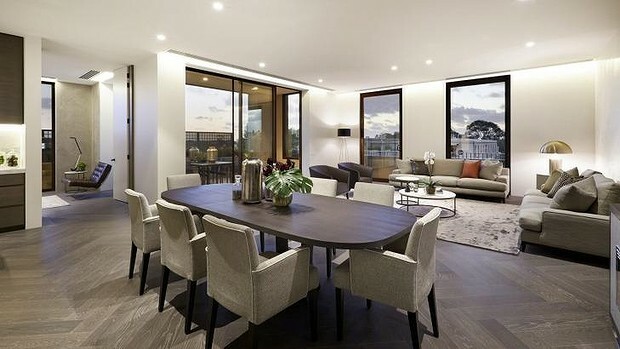 A high-end development of only 12 apartments on leafy Mathoura Road caters to such well-heeled buyers with a level of luxury and attention to detail more commonly seen in Toorak's grand mansions. The four-storey project, four kilometres from the CBD and only 100 metres from Toorak village, has been developed by Craig Easton, whose construction company is behind the building and fit-out of upmarket stores such as Tiffany & Co, Hermes and Armani. He has teamed up with architect Rob Mills, best known for his work on some of Toorak's grandest mansions. As the name suggests, Manhattan was inspired by the stately apartment buildings with formal concierges that Easton has admired around Central Park on his yearly visits to New York. "I've been going back to New York annually and looking around Central Park, Fifth Avenue and SoHo, as well as Boston, and you get a bit of inspiration everywhere," he says. "I knew what I was out to achieve and that is a high-end apartment building based on New York apartments with the concierge service." The Manhattan will have a concierge on site 20 hours a week to assist residents and also start their cars and bring in their mail if they are out of town. Interstate and international buyers are among those who have purchased the eight apartments already sold. Some of the luxurious touches of the 14 apartments, each with an individual floor plan, are the full-height solid doors of nearly three metres, herringbone-patterned flooring through the foyers and walls with stucco finishes. The gardens and terraces of each apartment and the building's common areas feature mature oak and magnolia trees and bronze urns in gardens designed by Toorak's favourite landscaper, Paul Bangay. 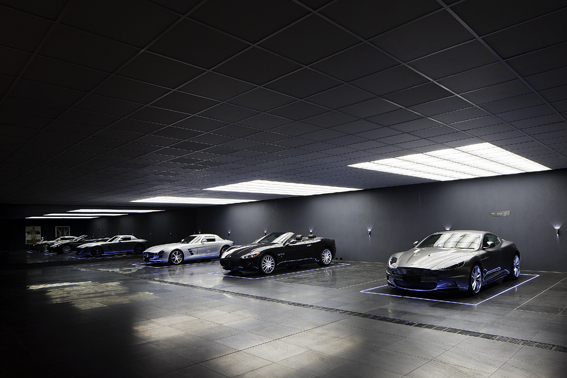 The high-end detail extends to the basement carpark with its painted walls, floors and ceilings rather than a concrete finish. There are 26 car spaces, including individual lock-up garages for some apartments. Manhattan's stunning penthouse which has a private swimming pool on its terrace was quickly snapped up. The project has one other three-bedroom apartment still on the market for $4.95 million with an internal size of around 291 metres and three car spaces. The remaining 12 apartments have two bedrooms and internal sizes of 125 to 218 square metres with a further 20 to 126 square metres of outdoor space for price tags from $1,995,000 to $4.5 million. 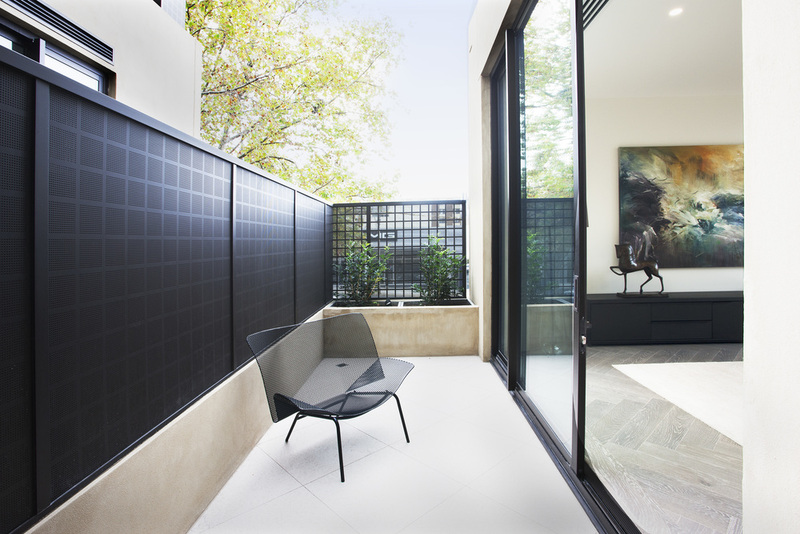 Manhattan is being marketed by Kay & Burton, South Yarra, phone 9820 1111. The apartments at 88 Mathoura Road, Toorak, can be inspected by appointment. Note: This article appeared in Domain on 21 March 2015. The full article can be viewed here.